The links below are affiliate links and MamaBreak may receive compensation for their use. What a perfect way to celebrate Spring!!! Do you know someone who is moving in the near future? Whether they're relocating for work or to be closer to family, now is the time to stock up on stylish and unique gifts for the home. 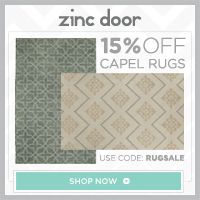 A new place means a new beginning and Zinc Door features modern furniture, accessories and decor. 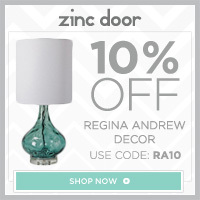 Plus, now through 5/14, Zinc Door is offering 10% off Regina Andrew Decor with promo code RA10 & 15% off Capel Rugs with code RUGSALE! Don't miss your chance to shop great gifts like the Regina Andrew Polished Horn & Brass Bowl or theRegina Andrew Ivory Grey Shagreen Hex Tray. Help them decorate their new home with style. Enjoy!